Hack Wilson drove in a record 190 runs in 1930 for the Chicago Cubs. You’re probably familiar with the term “built like a fireplug.” Caveman comic Barney Rubble, second banana to Fred Flintstone, fits the description. So did Chicago Cubs slugger Hack Wilson. Baseball-reference.com, the Internet’s reason for being, lists Wilson at 5-foot-6, 190 pounds. He probably checked in well over that by the sad ending. A sportswriter put it this way: “He was built like a beer keg and not entirely unfamiliar with its contents.” Hack Wilson liked to drink. A lot. For a handful of seasons, though, and for one glorious one in particular, Wilson punished fastballs and curveballs from even the best pitchers. One year, he set a record that still stands. More on that later. On this date in 1979, Hack was selected to enter the Hall of Fame. More on that in a bit, too. Wilson grew up in western Pennsylvania, just north of Pittsburgh, to alcoholic parents who never married. He quit school at age 16 to swing a sledgehammer for a locomotive company. He was a clean-up hitter in the making, his forearms getting bigger every day. The following year, in 1917, Wilson signed with the Leipersville, Pa., Field Club. By then, he wore size 5 ½ shoes but had an 18-inch-neck. He probably was stronger than anyone else in town. At first a catcher, he later moved to the outfield. Hack made it to the majors in 1923 with the New York Giants. He spent three seasons in New York, mostly as a part-time player, and hit a total of 16 home runs. Apparently, he got the nickname “Hack” while with the Giants. Manager John McGraw, another person determined to best describe Lewis Robert Wilson, said his young player looked like a “hack,” an early name for a taxi. The name stuck. Wilson, though, left New York in 1926 for Chicago and his glory days. The Giants, impatient with the young talent, had put him on waivers. The Cubs picked him up. Soon, Hack was blasting tape-measure home runs at Wrigley Field and enjoying his time as a fan favorite. He led the National League in home runs (21), drove in 109 and hit .321 with a .406 on-base percentage. He also got himself arrested early in the season, caught trying to leave a speakeasy ahead of the cop. It was a sign. And that was pretty much it. In 112 games in 1931, Wilson hit just 13 home runs, 43 fewer than he had hit the previous year. He drove in 61 runs, down 130 from ’30. His batting average, .356 in 1930, plummeted to .261. The Cubs sent their superstar to Brooklyn where he did mount something of a one-season comeback. He hit 23 home runs for the Dodgers in 1932 and drove in 123 with a .297 batting average. In his final year, split between Brooklyn and the Pittsburgh Pirates, the former superstar knocked just six out of the park. He was done at 34. In his 12-year career, Wilson launched 244 home runs with 1,063 RBI and a 307 batting average, .395 on-base percentage and .545 slugging average. Out of baseball, Wilson did what many ex-players did. He struggled. His business ventures never worked, he couldn’t get a job in baseball and finally found work as a laborer for the city of Baltimore. Until someone found out he was a former star baseball. Boy, that did it. They made him the manager of a city pool. 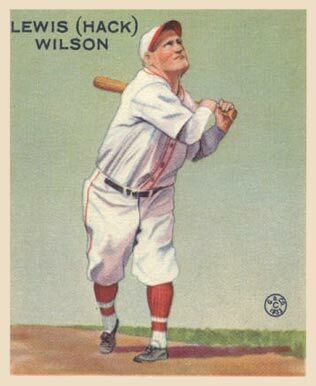 Hack Wilson died after he fell at home on Nov. 23, 1948, age 48. He didn’t have any money. Ford Frick, National League president, picked up the funeral bill. The undertaker donated a burial suit. Just before he died, a CBS reporter interviewed Wilson. Hack Wilson was one of the great ones, albeit not for long. There was almost always a sad turn to his story. Often, it was right around at the corner tavern. Many people forgot about Hack Wilson through the years. He never drew anything close to the needed 75 percent for Hall of Fame induction. Support for the slugger picked in the 1970s. Publications such as The Sporting News championed his cause. A 1978 biography probably also helped. The Veterans Committee finally voted in Wilson. The Brooklyn Dodgers’ Dazzy Vance posts a 2.61 ERA, more than one run lower than the next best ERA in the National League (3.87, the New York Giants’ Carl Hubbell). Vance suffers from a lack of run support and finishes with just a 17-15 won-loss record. Hack Wilson drove in 190 runs in 1930. Hack Wilson, a portly 5-feet-6-inches, slugs his way to a 56-home run season, then an NL record. The Chicago Cubs’ outfielder also drives in 190 runs, still a major league record, and wins the league MVP. George Watkins bats .373 for the St. Louis Cardinals, setting the major league mark for rookies. That is the best mark by far that the outfielder from Texas will ever post. He drops to .288 in his sophomore campaign and bats .312 in his third season. He retires after the 1936 season, a career .288 batter. The Boston Braves’ Wally Berger also turns in a precocious rookie season. The outfielder sets National League rookie records for home runs (38) and RBI (119). Unlike fellow rookie Watkins, Berger enjoys several good seasons and hits .300 with 242 homers over an 11-year career. Sam Rice shows off the wisdom of experience. The Washington Senators’ right-fielder collects 207 hits, 271 total bases and scores 121 runs at the age of 40. Rice goes on to play another four seasons. He bats .322 over his career, collects 2,987 hits and goes into the Hall of Fame in 1963. The New York Giants’ Bill Terry hit .401. He is the last National League player to bat at least .400 over a single season. The first baseman retires with a .341 average over his illustrious career and enters the Hall of Fame in 1954. 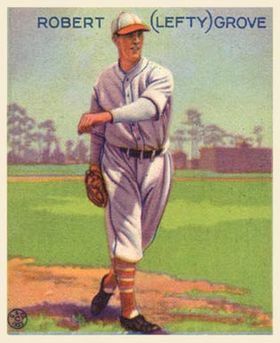 Lefty Grove won 28 games in the regular season and two more in the World Series. Robert Moses “Lefty” Grove, ace of the Philadelphia A’s, tops the major leagues in wins (28), winning percentage (.848), strikeouts (209) and, believe it not, saves (nine). Like Vance, Grove wins the ERA title by a wide margin. He finishes at 2.54, or .77 lower than Cleveland’s Wes Ferrell. Grove wins exactly 300 games in his career and nine ERA titles. Maybe the greatest left-handed pitcher in history, he is elected to the Hall of Fame in 1947. Babe Ruth holds out and signs a record contract–$80,000. The Babe leads the American League in home runs (49), but the New York Yankee slugger also becomes the first player to ever strike out 1,000 times in his career. Al Simmons enjoys another big year in his career for the A’s. He leads the A.L. in batting average (.381), runs scored (152) and runs produced (281). “Bucketfoot Al”, born Aloys Szymanski, enjoys a Hall of Fame career, batting .334 lifetime with 307 home runs. The A’s, behind the pitching of Grove and George Earnshaw, beat the Cardinals in a six-game World Series. Grove and Earnshaw both win two games for Philadelphia, which went 102-52 in the regular season. The Cardinals, who were 92-62, score just 12 runs in the Series after averaging a league-leading six runs a game. The longest game goes one hour, 58 minutes. The Series title is the A’s fifth and final in Philly.